There have most definitely been past loves that have stood the test of time and I look back them with fond memories and many thanks to my past self’s for-sight for having the sense of mind to snap a photo. You have seen this picture on the main page, but I thought it would be a great injustice not give the full view of this dessert bomb that was dropped on me while traveling to visit a friend in Kyoto, Japan. I had no idea that this dessert heifer was coming my way when I ordered it. I still remember the way they served it with a cute little metal pour, like you might see milk served with for coffee. 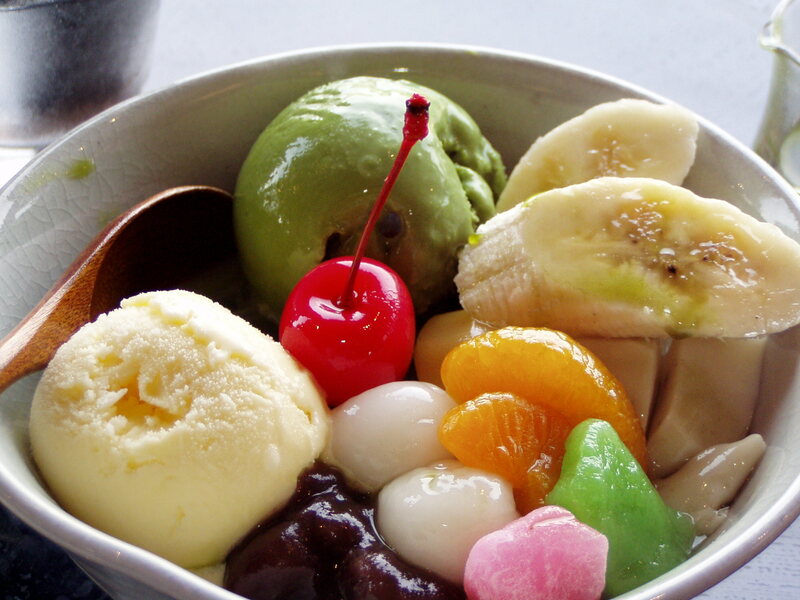 Only it was filled with a delicate green tea sweet syrup that I poured all over my amistu dessert. You can see a little bit of it on the banana. One of the best I ever had. I really wish I could have remembered the location it was served at, but we were visiting so many temples in this temple town I can’t remember which one that it was near. If you ever find yourself in Kyoto, there are several tea shops to enjoy these at so I recommend doing just that.